The most surprising game was a loss of top-ranked Mobis Phoebus (29-10) in Ulsan on Wednesday night. 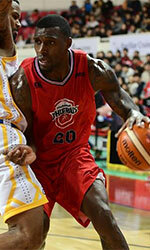 Hosts were edged by seventh ranked Goyang Orions (19-19) 77-74. Goyang Orions made 16-of-20 free shots (80.0 percent) during the game. American power forward Darryl Monroe (201-86, college: George Mason) orchestrated the victory with a double-double by scoring 27 points, 11 rebounds and 4 assists. International center Seung-Hyun Lee (201-92) contributed with 13 points and 8 rebounds for the winners. The former international forward Ricardo Ratliffe (203-89, college: Missouri) answered with a double-double by scoring 21 points and 11 rebounds for Mobis Phoebus. Mobis Phoebus' coach Jae-Hak Yoo tried various players' combinations and tested in total eleven players in this game, but that didn't help. Goyang Orions have a solid series of three victories in a row. They moved-up to sixth place. Mobis Phoebus at the other side still keep top position with ten games lost. Goyang Orions are looking forward to face SK Knights (#9) in Seoul in the next round. Mobis Phoebus will play at home against KT Sonicboom (#3) and it may be a tough game between close rivals. Eighth-ranked Anyang KGC (17-22) was very close to win a game against third ranked KT Sonicboom (22-16) in Busan. KT Sonicboom managed to secure only three-point victory 85-82. However their fans expected much easier game. The former international forward Hongseok Yang (199-97) stepped up with a double-double by scoring 22 points and 13 rebounds for the winners and Joel Hernandez chipped in 20 points and 8 assists. KT Sonicboom's coach Dong-Chul Seo allowed to play the deep bench players in such tough game. American forward Reyshawn Terry (203-84, college: N.Carolina) responded with 29 points and 6 rebounds. KT Sonicboom maintains third place with 22-16 record having eight points less than leader Mobis Phoebus. Anyang KGC lost seventh consecutive game. They keep the eighth position with 22 games lost. KT Sonicboom will play against league's leader Mobis Phoebus in Ulsan in the next round and it will be for sure the game of the week. Anyang KGC will play on the road against DB Promy (#7) in Wonju and it may be a tough game between close rivals. A very close game took place in Jeonju between KCC Egis and Anyang KGC. Fifth ranked KCC Egis (20-19) got a very close home victory over 8th ranked Anyang KGC (17-22). KCC Egis managed to escape with a 3-point win 109-106 on Tuesday evening. Brandon Brown nailed a double-double by scoring 39 points (!!! ), 15 rebounds and 7 assists for the winning side. Reyshawn Terry came up with a double-double by scoring 24 points and 17 rebounds for Anyang KGC in the defeat. Anyang KGC's coach Seung-Ki Kim tried various players' combinations and tested in total eleven players, but that didn't help to avoid defeat in this game. KCC Egis have a solid series of four victories in a row. They maintain fifth place with 20-19 record. Anyang KGC lost seventh consecutive game. They keep the eighth position with 22 games lost. KCC Egis will meet higher ranked LG Sakers (#4) in the next round and it will be quite challenging to get another victory. Anyang KGC will play against DB Promy (#7) in Wonju and it may be a tough game between close rivals. Worth to mention about the upset in a game between KCC Egis (20-19) and SK Knights (12-26), which took place in Seoul. Higher ranked KCC Egis lost to ninth ranked SK Knights in a road game 86-90. It ended at the same time the four-game winning streak of KCC Egis. The best player for the winners was Aaron Haynes who had a double-double by scoring 31 points and 18 rebounds. SK Knights' coach Kyung-Eun Moon used an eleven-player rotation in such tough game. Defending champion maintains ninth place with 12-26 record. KCC Egis at the other side keep the fifth position with 19 games lost. SK Knights' next round opponent will be higher ranked Goyang Orions (#6) in Daegu and it will be quite challenging to get another victory. KCC Egis will play on the road against LG Sakers in Changwon and it may be a tough game between close rivals. The game between 10th ranked Samsung Thunders (10-28) and third ranked KT Sonicboom (22-16) in Seoul on Tuesday ended with biggest points difference. 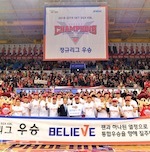 Guests from Busan beat Samsung Thunders 100-85. Hongseok Yang orchestrated the victory with a triple-double by scoring 13 points, 12 rebounds and 12 assists. Samsung Thunders' coach let to play twelve players which allowed the starters a little rest for the next games. KT Sonicboom maintains third place with 22-16 record having eight points less than leader Mobis Phoebus. Samsung Thunders lost third consecutive game. They stay dead last with 28 lost games. KT Sonicboom will face league's leader Mobis Phoebus in Ulsan in the next round and it will be for sure the game of the week. Samsung Thunders will play on the road against the league's second-placed ET Land Elephants (#2) in Inchon and hope to win that game. In the last game of round 29 DB Promy was beaten by LG Sakers on the road 110-105. A very close game took place in Jeonju between KCC Egis and Anyang KGC. Fifth ranked KCC Egis (20-19) got a very close home victory over 8th ranked Anyang KGC (17-22). KCC Egis managed to escape with a 3-point win 109-106 on Tuesday evening. KCC Egis shot 33 for 44 from the free-throw line, while Anyang KGC only scored seven points from the stripe. American Brandon Brown (201-85, college: CS San Bernar.) nailed a double-double by scoring 39 points (!!! ), 15 rebounds and 7 assists for the winning side and the former international forward Jung-Hyun Lee (191-87) accounted for 35 points (!!! ), 5 rebounds, 4 assists and 4 steals. Brown is a former Eurobasket Summer League player, which is considered top international summer league in the market. American forward Reyshawn Terry (203-84, college: N.Carolina) came up with a double-double by scoring 24 points and 17 rebounds and Canadian guard Justin Edwards (190-92, college: Kansas St.) added 30 points and 5 assists respectively for Anyang KGC in the defeat. Four Anyang KGC players scored in double figures. Anyang KGC's coach Seung-Ki Kim tried various players' combinations and tested in total eleven players, but that didn't help to avoid defeat in this game. KCC Egis have a solid series of four victories in a row. They maintain fifth place with 20-19 record. Anyang KGC lost seventh consecutive game. They keep the eighth position with 22 games lost. KCC Egis will meet higher ranked LG Sakers (#4) in the next round and it will be quite challenging to get another victory. Anyang KGC will play against DB Promy (#7) in Wonju and it may be a tough game between close rivals. The game between 10th ranked Samsung Thunders (10-28) and third ranked KT Sonicboom (22-16) in Seoul on Tuesday ended with biggest points difference. Guests from Busan beat Samsung Thunders 100-85. KT Sonicboom looked well-organized offensively handing out 26 assists. The former international forward Hongseok Yang (199-97) orchestrated the victory with a triple-double by scoring 13 points, 12 rebounds and 12 assists. American forward Marcus Landry (201-85, college: Wisconsin) contributed with 20 points and 8 rebounds for the winners. Five KT Sonicboom players scored in double figures. American forward Eugene Phelps (198-90, college: Long Beach St.) answered with a double-double by scoring 26 points, 11 rebounds and 7 assists and the other American import guard Nate Miller (193-87, college: Bowling Green) added 15 points and 5 rebounds in the effort for Samsung Thunders. Samsung Thunders' coach let to play twelve players which allowed the starters a little rest for the next games. KT Sonicboom maintains third place with 22-16 record having eight points less than leader Mobis Phoebus. Samsung Thunders lost third consecutive game. They stay dead last with 28 lost games. KT Sonicboom will face league's leader Mobis Phoebus in Ulsan in the next round and it will be for sure the game of the week. Samsung Thunders will play on the road against the league's second-placed ET Land Elephants (#2) in Inchon and hope to win that game. The game between closely ranked teams ended with fifth ranked LG Sakers' (20-18) home victory over 6th ranked DB Promy (18-20) in Changwon 110-105 on Wednesday. LG Sakers shot 34 for 48 from the free-throw line, while DB Promy only scored thirteen points from the stripe. DB Promy was plagued by 29 personal fouls down the stretch. Central African-American power forward James Mays (205-86, college: Clemson) orchestrated the victory with a double-double by scoring 34 points (!!!) and 10 rebounds. The former international point guard Si-Rae Kim (179-89) contributed with 28 points for the winners. American guard Marcus Foster (190-95, college: Creighton, agency: Pensack Sports) answered with 36 points (!!!) and 6 rebounds and the other American import power forward Leon Williams (203-86, college: Ohio) added 17 points and 14 rebounds in the effort for DB Promy. Both teams had five players each who scored in double figures. DB Promy's coach Sang-Bum Lee tried various players' combinations and tested in total eleven players, but that didn't help to avoid defeat in this game. LG Sakers have an impressive series of five victories in a row. They moved-up to fourth place. Loser DB Promy dropped to the seventh position with 20 games lost. LG Sakers will face KCC Egis (#5) in Jeonju in the next round. DB Promy will play at home against Anyang KGC and it may be a tough game between close rivals. The most surprising game was a loss of top-ranked Mobis Phoebus (29-10) in Ulsan on Wednesday night. Hosts were edged by seventh ranked Goyang Orions (19-19) 77-74. Goyang Orions made 16-of-20 free shots (80.0 percent) during the game. American power forward Darryl Monroe (201-86, college: George Mason) orchestrated the victory with a double-double by scoring 27 points, 11 rebounds and 4 assists. International center Seung-Hyun Lee (201-92) contributed with 13 points and 8 rebounds for the winners. The former international forward Ricardo Ratliffe (203-89, college: Missouri) answered with a double-double by scoring 21 points and 11 rebounds and American guard Shannon Shorter (193-89, college: N.Texas) added 15 points and 6 rebounds in the effort for Mobis Phoebus. Four Mobis Phoebus players scored in double figures. Mobis Phoebus' coach Jae-Hak Yoo tried various players' combinations and tested in total eleven players in this game, but that didn't help. Goyang Orions have a solid series of three victories in a row. They moved-up to sixth place. Mobis Phoebus at the other side still keep top position with ten games lost. Goyang Orions are looking forward to face SK Knights (#9) in Seoul in the next round. Mobis Phoebus will play at home against KT Sonicboom (#3) and it may be a tough game between close rivals. Worth to mention about the upset in a game between KCC Egis (20-19) and SK Knights (12-26), which took place in Seoul. Higher ranked KCC Egis lost to ninth ranked SK Knights in a road game 86-90. It ended at the same time the four-game winning streak of KCC Egis. SK Knights made 21-of-23 charity shots (91.3 percent) during the game. They outrebounded KCC Egis 43-30 including 28 on the defensive glass. The best player for the winners was American forward Aaron Haynes (201-81, college: Boise St.) who had a double-double by scoring 31 points and 18 rebounds. International guard Sunhyung Kim (187-88) chipped in 11 points and 4 assists. SK Knights' coach Kyung-Eun Moon used an eleven-player rotation in such tough game. American Brandon Brown (201-85, college: CS San Bernar.) produced a double-double by scoring 19 points, 13 rebounds and 9 assists and the former international forward Kyo-Chang Song (200-96) added 21 points respectively for the guests. Five SK Knights and four KCC Egis players scored in double figures. Defending champion maintains ninth place with 12-26 record. KCC Egis at the other side keep the fifth position with 19 games lost. SK Knights' next round opponent will be higher ranked Goyang Orions (#6) in Daegu and it will be quite challenging to get another victory. KCC Egis will play on the road against LG Sakers in Changwon and it may be a tough game between close rivals. Eighth-ranked Anyang KGC (17-22) was very close to win a game against third ranked KT Sonicboom (22-16) in Busan. KT Sonicboom managed to secure only three-point victory 85-82. However their fans expected much easier game. KT Sonicboom made 16-of-21 charity shots (76.2 percent) during the game. Their players were unselfish on offense dishing 21 assists. The former international forward Hongseok Yang (199-97) stepped up with a double-double by scoring 22 points and 13 rebounds for the winners and Dominican guard Joel Hernandez (190-95, college: LIU Brooklyn) chipped in 20 points and 8 assists. Four KT Sonicboom players scored in double figures. KT Sonicboom's coach Dong-Chul Seo allowed to play the deep bench players in such tough game. American forward Reyshawn Terry (203-84, college: N.Carolina) responded with 29 points and 6 rebounds and Canadian guard Justin Edwards (190-92, college: Kansas St.) scored 24 points, 7 rebounds and 4 assists. KT Sonicboom maintains third place with 22-16 record having eight points less than leader Mobis Phoebus. Anyang KGC lost seventh consecutive game. They keep the eighth position with 22 games lost. KT Sonicboom will play against league's leader Mobis Phoebus in Ulsan in the next round and it will be for sure the game of the week. Anyang KGC will play on the road against DB Promy (#7) in Wonju and it may be a tough game between close rivals.